We welcome people from all disciplines to contribute to our initiatives. An internship with LCHR is a challenging, interesting and exciting experience for those committed to human rights and social justice. Several interns have experienced path-breaking opportunities to participate in movements for social transformation. A strong sense of commitment to human rights and a keen interest in social justice and legal issues will make one eligible to be an intern in LCHR. One who possesses an eagerness to interact and learn, along with good research, writing and communication skills may apply. Persons with legal, human rights, social work, health and communications background will be preferred. We offer interns an exposure to the legal and social aspects of public interest work, thereby allowing them to develop skills and an insight into how law and social activism combined can achieve practical benefits for the poor and vulnerable. Based on their interests, interns are assigned to work in factual and legal research relating to our initiatives, drafting legal petitions, fact-findings, publications, communications such as the website designing, writing, publications and organizing of workshops and conferences. We expect interns will behave in a professional and responsible manner during their time with the LCHR. During internship period they will be assigned a supervisor with whom they will interact and report. At the end of the internship period they are expected to handover all the documents and materials to LCHR and submit a report to their supervisor. They will also be requested to fill out a feedback form. While providing an opportunity for interns to study and to engage in conflict situations LCHR, though careful, cannot take responsibility in any way for the safety or security of any person. Nor can LCHR assume any liability for any action of any intern/volunteer. Interns are at liberty to refuse any assignment to travel outside the office and may also decline any work which they feel compromises their safety. 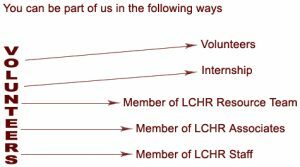 LCHR is unable to pay or reimburse any intern/volunteer for their travel, food and accommodation expenses. Apply with your CV and the time period during which you would like to intern.